$780 per year, or a 7.80% return, for life. A Federal charitable deduction of $5,600. $640 of each year’s income is tax-free for approximately 5.5 years. Q: What are the minimum and maximum amounts I can invest? A: A $10,000 commitment will start your Nine Network Gift Annuity. There is no maximum limitation. Q: Will the rate of payments change? A: No. The rate on your certificate will remain the same throughout your lifetime. Q: Can I start my Gift Annuity by donating stocks instead of cash? A: Yes, we will gladly accept stock certificates. Please call Roya Bromell at 314-512-9129 for details on how to transfer your securities. Q: What becomes of my Gift Annuity after my death? A: After the death of the last income beneficiary, the remainder of your gift is used by the Nine Network as determined by its Board of Directors to further its work of serving the St. Louis region. Q: How much of my Annuity is tax-free? A: This depends on your age at the time you contract for the Gift Annuity, and how often you wish to receive payments. The older a person is on the day the Annuity is issued, the greater the percent of income he or she can shield from income taxes. Q: Are Gift Annuities a part of one’s estate? A: They are usually completely excluded from one’s estate taxes. Q: Can I set up a Gift Annuity through my Will? A: Yes, this is called a Testamentary Annuity. Ask us about the details. Q: Can Annuity checks be directly deposited in my bank just like Social Security checks? A: Yes, just as soon as you notify us of the arrangements you make with your financial institution. 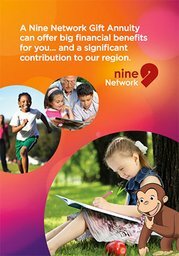 Have you considered the benefits of obtaining a charitable gift annuity with the Nine Network? 1. You Like Attractive Rates. Mr. and Mrs. Smith, in their mid-80s, are receiving a modest income from their Certificate of Deposit. When the CD matures in two months, they plan to obtain a Nine Network gift annuity and start receiving a 6.7 percent return. 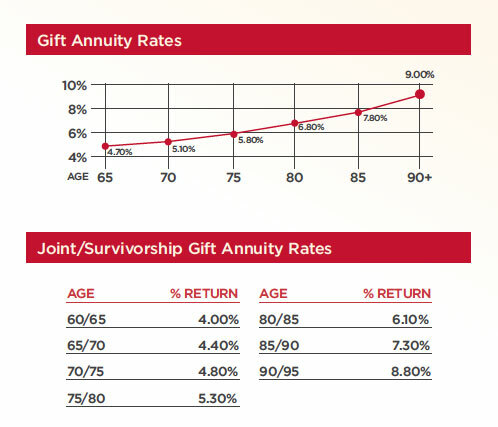 Gift annuity rates are very attractive for older friends of the Nine Network. You can receive as much as 8.5 percent for a two-life annuity and 9 percent for a single-life annuity. Many folks in their retirement years will be pleased when they compare their low investment rates with the current annuity rates offered by the Nine Network. 2. You Like Tax-Free Payments. Part of each annuity payment is tax-free. For example, Mrs. Jones, age 85, contributed $25,000 toward a gift annuity. Every year, she will receive $1,950 (7.8 percent). Of this amount, more than half will be excluded from income taxes. The tax-free portion of the annuity payment is considered “return of principal” and continues through your estimated life expectancy. 3. You Like Tax Deductions. Because a charitable gift annuity is partly a gift and partly an investment in an annuity contract, the donor who itemizes is entitled to an income-tax deduction for the gift portion of his or her annuity. In the case of Mrs. Jones mentioned earlier, her $25,000 gift annuity produced a charitable tax deduction of more than $14,000. The deduction is available for the tax year when the gift annuity is established. If it cannot be used entirely, the donor has up to five years to carry forward the unused amount. The tax advantages with the charitable deduction make the effective rate of the gift annuity even higher than the rate used to establish the annuity. If you want an income-tax deduction, the Nine Network Gift Annuity is for you. 4. You Like Fixed, Regular Payments. It’s nice to be able to count on a specific amount of payment no matter what happens to the financial markets. Your annuity payments will not change from year to year. And since gift annuity payments are backed by the full assets of the Nine Network, you have assurance that your check will be in the mail (or direct deposited) every payment date for the rest of your life. If you want fixed, regular payments you can count on, then the Nine Network Gift Annuity is for you. 5. You Love the Nine Network! Perhaps the greatest benefit of a Nine Network Gift Annuity is the personal fulfillment you receive by helping future generations take advantage of free enlightened education and entertainment. Your gift annuity assists a worthy cause that makes a difference in the lives of countless children and adults in our region. The Nine Network Gift Annuity Program is designed to give you the satisfaction of supporting this noble mission—and to provide you the security of a guaranteed lifetime income—an income free from care and safe from the uncertainties of the economy.